Orissa is under the climate of crime. Chief Minister Navin Patnaik has dragged this splendid and traditionally peaceful land into the hot lap of capitalism and all the crimes that capitalism generates and instigates have now engulfed the State. Administration has gone such astray that the people of Orissa are being compelled to pay for officers who under official orders are exempted from rendering any service! This was earlier done in cases of noted miscreants Ramesh Behera and Santosh Mishra of Indian Administrative Service as well as Sisir Acharya and Amaresh Jaiswal of Indian Forest Service. Now it is Priyabrata Pattnaik of IAS. But the Chief Minister protecting Priyabrata from Law is not new. In 2000, his conduct in context of a youth congregation styled Dreamfest at the Bhubaneswar Club was so sexually offensive and crude that the Government had been compelled to appoint a single judge judicial enquiry headed by District Judge Mahendra Patnaik. His report was submitted to Chief Minister Navin Patnaik. It has been suppressed and no action has been taken as yet. His conduct in respect of the most valuable Kandadhara mines needed special investigation when people of Orissa were sharpening their protest against POSCO. The foreign firm was so eager to grab Khandadhar mines and was so apprehensive of not getting it in view of public protests that it was suspected to have tried to succeed in its design using the Bhubaneswar club headed by Priyabrata as a mask. The secret deal could have been unveiled had the modus operandi of Bhubaneswar Club applying for Khandahara on lease been investigated into and Priyabrata’s clandestine connection, if any, with POSCO in violation of the Code of Conduct of Government Servants could have come to light. This could not happen as the Chief Minister’s chair was occupied by Navin Patnaik. Going into the history of such misdemeanor is not relevant at the moment. What is relevant is the conduct of Chief Minister in protecting him despite he having admitted that Priyabrata’s conduct was not becoming of an officer. The order he has passed for posting of Priyabrata as Officer without portfolio confirms that the Government has lost confidence in the officer. To the Government he is not trustworthy. But by posting him as Officer without portfolio, Navin has ensured that he shall continue enjoying his rank and receiving his salary sans any work and the peoples shall go on bearing compulsorily the burden of his high pay package without obtaining any service from him. This is sufficient evidence of how the Chief Minister has supported a man whose nexus with the underworld has hit the police hard emanating directly from the lips of a contract killer who by profession is a hit man, in course of interrogation in the matter of cold-blooded murder of Judo coach Biranchi Das. Murder of Biranchi yet unsolved and suspected assassins yet at large; it does not look correct to deal with that subject. In our view, police should be kept off pressure so that investigation would proceed systematically. Media activism should be least encouraged in crime investigation. The media in Orissa has no criminologist on employment and no media organization has ever imparted in-service training in criminology to any journalist reporting crime. So, as we have watched, Orissa media having no education or expertise in criminology, has overwhelmed the process of investigation with uncalled for suggestions, unqualified suspicions and immature innuendoes and like mud water suits the crab, the confusion created by media has suited the assassinator of the Judo coach so far. Therefore without any prejudice to how the prosecutors are proceeding in the instant case, we shall limit our focus on the climate of crime the CM has allowed to engulf Orissa in Priyabrata context. This blue-eyed boy of POSCO-Navin nexus, after Acharya’s close colleague Chagala alleged that the hit men including himself were engaged by Priyabrata, had wanted to keep on records in a press conference that he neither had known nor had ever seen gangster Raja Acharya, the suspected killer of Biranchi. But in course of a mild interrogation he confessed before the police that he had met Raja a couple of days before Biranchi was murdered. Whether or not he had hired the hit men is a matter for the State to reveal. But the people do not wait for the State to see how the needle of suspicion is sharply rushing towards him. By posting him as an officer without portfolio, Navin Patnaik has ensured that he can freely and in opportune moments contact any functionary anywhere in the citadel of power. In the climate of crime that Navin Patnaik has ushered into Orissa, what better method could have been invented to help an untrustworthy officer escape Law? With this site exposing how Buddhists all over the world have failed to honor canonical instruction for paying homage to Gurudev Buddha in the place of his birth at least once in life, as they are misled by a historical mischief placing his birthplace in Nepal, there was a short-lived but acrimonious shrill of protest in a section of global media following which a new wave of academic activities has commenced flowing with incisive interest to find out if Orissa’s claim is correct. 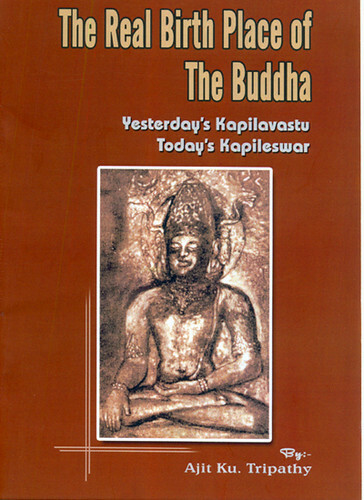 We are sure, the truth must prevail and the future world shall surely accept Kapilavastu of Tosala, converted to present day Kapileswar near Bhubaneswar, as the real birthplace of Buddha; because that is his birthplace. Intellectuals who are seriously pursuing this issue are active in different parts of the glove. One of these truth seekers is Sri Ajit Kumar Tripathy, an IAS officer, currently the Chief Secretary of Orissa. 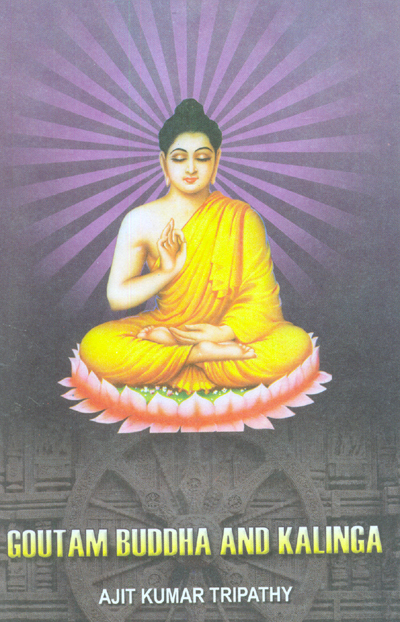 He has published two booklets on Buddha’s birthplace abridging the research work of late Pandit Chakradhar Mohapatra, who was the first to revive the status of Kapileswar as the birthplace Kapilavastu of Buddha. 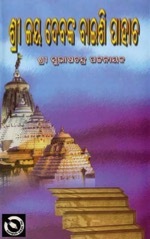 Produced with clarity and in eloquent English, the two booklets, while acknowledging the contributions of Mohapatra, inasmuch as the author telling us that he “does not claim any original research on the subject of birthplace of Gautam Buddha but he has arranged the materials systematically often using the same language in the book of Sri Chakradhar Mohapatra” (preface to Goutam Buddha and Kalinga), it is clear from the steps Tripathy has taken that he has gone through the findings of Mohapatra quite seriously and juxtaposing them with materials and observations of eminent scholars beyond Mohapatra, has been convinced that yesterday’s Kapilavastu is today’s Kapileswar and therefore, by systematically abridging the arguments Mohapatra in his two booklets has advanced, he has added authenticity to his finding. Students of history all over the world would be glad to note that Tripathy’s step is a positive step towards making history arrive at the truth in the matter of Orissa being Buddha’s birthplace. As initiator of global debate in this matter we offer our thanks to Mr. Tripathy. Describing how Orissa had attacked and subdued the Muslim Bengal, Dr. K. R. Quanungo writes in ‘The History of Bengal, Muslim Period’ at pp.48-52, that, Tughral Tughan Khan was no doubt out-generalled by the king of Orissa who had drawn the enemy far away from their frontier and must have concealed more than one surprising party along the whole route of the enemy’s advance. 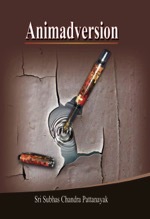 A greater disaster had not till then befallen the muslims in any part of Hindustan. The Muslims, says Minhaj [the historian Minhaj-i-Siraj who had also joined the war that was, to him, a ‘holy war’], sustained the overthrow, and a great number of those holy warriors attained martyrdom. Relying on Havel, who noted in ‘Indian Sclupture and Painting’ that the war horses and elephants sculptured at Konarka depict the “pride of victory and glory of triumphant warfare”, Dr. K. C. Panigrahi writes in ‘History of Orissa’ at pp.413-414 that King of Orissa, Langula Narasimha “began his campaigns against Muslim Bengal in 1243 A.D. His victory over the Muslims of Bengal and his acquisition of the southern districts of Western Bengal must have enormously raised his prestige in the eyes of the contemporary Hindu Rulers, and augmented his resources, which in all likelihood enabled him to undertake the construction of a stupendous structure like the temple of Konark, designed to exhibit his power, prestige, opulence, devotion and perhaps to commemorate his victory also”. But despite this truth recorded by history, Bankim Chandra of Bengal had overreached over a Bengali claim over Konarka through throwing an article in a school textbook in Bengali that Narasingh Dev belonged to Bengal and the Sun temple was an epitome of Bengali architecture! Bankim Chandra’s trick was just an instance of how taking advantage of the British rule in Bengal when Orissa had kept them at bay and was the last land to have been annexed by the British but the first land to have raised a revolution against them in the entire country of India, the Bengalis had tried to misappropriate every gem of Oriya culture to create for themselves a fabricated cultural heritage. 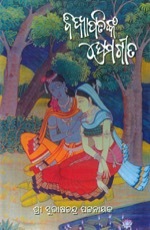 Their false claims over Sri Jaya Dev, creator of Radha and author of Sahajiya love lyrics squeezed into the Geet Govind as well as on Chaurashi Siddhacharyas, authors of Charyagitis (Bauddha Gan o Doha) have been exposed in these pages, wherein their mens rea behind this cultural dishonesty has been discussed. It has also been discussed in these pages that the sculptures of Konark, the love lyrics of Sri Jaya Dev and the Charyagitis of Chaurashi Siddhacharyas are intricately linked to and influenced by Orissa’s now extinct Mahodadhi Civilization. The sea in Orissa region was famous as the Mahodadhi. But the Bengalis, under circumstances hinted to above, as in the aforesaid three instances, have succeeded in changing the name of Mahodadhi to Bay of Bengal. This wrong done to history needs correction. 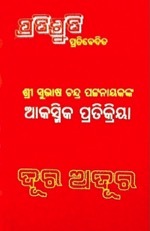 The Mahodadhi civilization of Orissa was so developed that in whole of India, it was only Orissa the people of which were the pioneers amongst Indians to establish their colonies and dominions in far away lands beyond Indian limits where geographical names akin to names of Orissa give ample evidences in this regard. “The ancient name attributed to old Prome is Srikshetra, so often mentioned in the Mon records as Sikset or Srikset, and by the Chinese pilgrims as Si-li-cho-ta-lo; and Srikshetra is the holy land of Puri on the ancient Kalinga coast”. Melaka, one of the thirteen States of Malaysia, was founded 2 degrees north of the equator by the shore of the Straits between Singapore to its south and Kuala Lumpur to its north by an Oriya prince, probably Hamvira (known there as Hang Tuah), which as far back as the early 15th century, had become a metropolis with traders and merchants of very many nations from east and west having there their business negotiation centers. It was developed by its founder for this purpose and also as a common shelter for seafaring traders and the response was so worm that as many as 84 different languages were being spoken there at the height of its glory. Melaka is a typical Oriya word (as in MELAKA PADICHHI RAJA YOTAKA) and the place where the prince of Orissa, its founder, breathed his last and took his final rest is famous as Tanjung Keling. When people of the place mean Kalinga (Orissa) by Keling, Tanjung means to people of Orissa even today the moving throne of the king and it stands for the chair on which seated the Gajapati Maharaja of Puri visits the temple or chariots of Sri Jagannatha. A letter received recently from Sri Ramroop Jugurnauth of Mauritius is very significant. He writes, “My ancestors came to Mauritius more than 150 years ago. I made searches for my roots and I came to know that my ancestor came from Orissa. 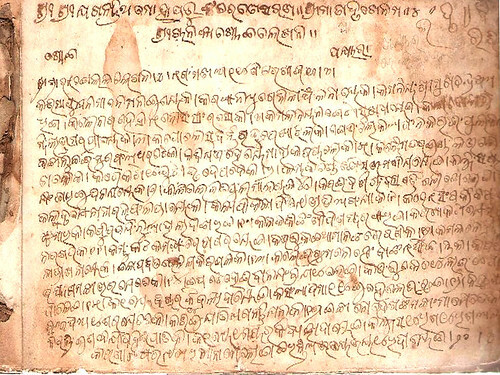 I also have in my possession some handwritten documents in an ancient Indian language. An Indian friend of mine forwarded it to the BHU (Language Dept). There they confirmed it to be an ancient Oriya. 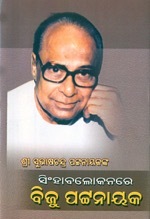 I therefore consider myself a cut-off branch from Oriya culture”. 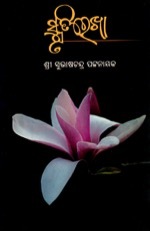 He further writes, “My family name Jugurnauth is infact Jagganath and it itself suggests my Oriya origin”. 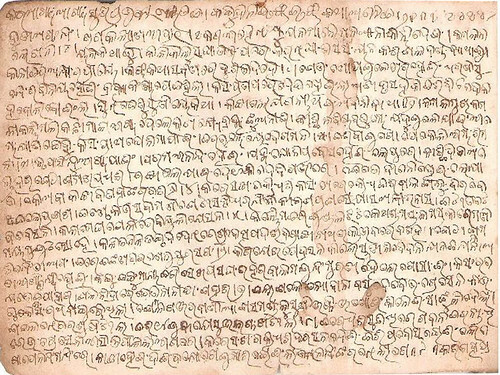 The pictures below are pages of handwritten Oriya manuscripts preserved by his family for 150 years in Mauritius. Be it Mauritius or Melaka, be it Singapore or Ceylon, it is Oriyas of India that had established their colonies and commercial empires because they alone had the best of ships and shipping activities. Even the British have admitted it. Writing to W.B.Bayley, Secretary to Government in the Judicial Department, in his Report dated 3 May 1817, E. Watson, 4th Judge, Calcutta Court of Circuit has unambiguously told of the ships of Orissa that they “were by far the best that I ever saw in any part of India”. Nowhere any of the British authorities has recognized so eloquently any marine activity of Bengal even though they had there their seat of power. So, it was wrong on part of the British to have named the sea that was under shipping activities principally of the people of Orissa as Bay of Bengal. This offense the British colonialists and their Bengali collaborators have committed against the people of Orissa by obliterating the ancient name of Mahodadhi and by replacing it with Bay of Bengal shall have to be changed in respect of Orissa region. This should be the program of Oriyas on the occasion of celebration of the birthday of Madhubabu (Kulabruddha Madhusudan Das) today. HOW DO YOU RATE THIS GOVERNMENT? Now I am not going to tell you how manufacturers of fake medicines have enjoyed political patronage when Navin Patnaik has been running the State Government. I am not going to tell you how contractors have hijacked welfare projects under the umbrage of administration. I am not going to tell you how social auditors have held the State Government responsible for embezzling of public exchequer by persons in power. I am not going to tell you how the Comptroller and Auditor General of India has unveiled massive misappropriation of official funds by functionaries in different departments under Navin Patnaik’s regime. I am not going to tell you how Navin Patnaik has shown eager interest in handing over Orissa’s mineral and other natural resources to non-Oriya and even non-Indian business operators when about 70 percent of the children of this soil are perishing sans land and livelihood. I am not going to tell you how underworld has built up nexus with the police and how mafia is ruling the roost. I am not going to tell you of this; because, you know all this and much more. I am going to tell you how Navin Patnaik Government is playing havoc with human life by willfully killing the Laws of the land. And, I will place only a few examples. We all know that bio-medical waste is very harmful to human health. For its management and handling, a specific set of Rules, called The Bio-Medical Waste (Management and Handling) Rules, 1998 has been framed and enforced. “every occupier of an institution generating bio-medical waste which includes a hospital, nursing home, clinic, dispensary, veterinary institution, animal house, pathological laboratory, blood bank by whatever name called, is to take all steps to ensure that such waste is handled without any adverse effect to human health and the environment”. 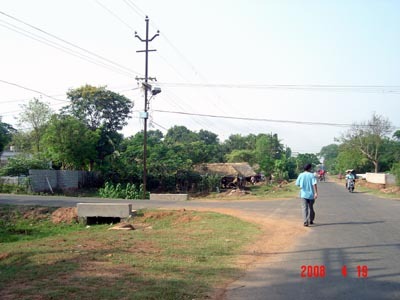 Bhubaneswar is the capital city of the State. The main hospital of this city is the Capital Hospital. It has overcrowded wards in almost all streams of human health. General Surgery to Orthopedics to Dental to Gynecology to Gastroenterology to Pediatrics to contagious diseases- every ward is overcrowded by indoor patients. It has Operation Theaters – general and departmental- minor and major; it has pathological labs and blood bank and it generates massive bio-medical waste everyday. 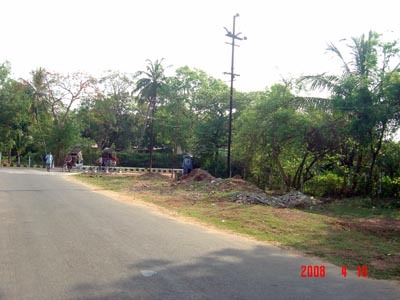 It stands on the road traversed daily by Chief Minister Navin Patnaik between his residence and the Secretariat. His party headquarters stands adjacent to this hospital. How does it handle the bio-medical waste? The picture placed below should tell you that. 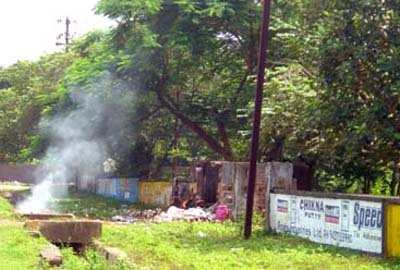 The hospital has kept broken the western side of its compound wall through which the waste is shunted out into the open space touching the public road and as rag-pickers jump on to it in search of used syringes and transmission pipes etc that find buyers in the recycling racket, the concerned staff sets fire to the waste deposits. The smoke spreads clouds of obnoxious smell all over the adjoining locality. If this is how the bio-medical waste is handled by the Capital Hospital, I think, you can easily grasp what havoc Navin Patnaik government is playing with human health in other parts of Orissa. But such mismanagement of bio-medical waste is not the only hazard that human society has been subjected to under the Navin regime. 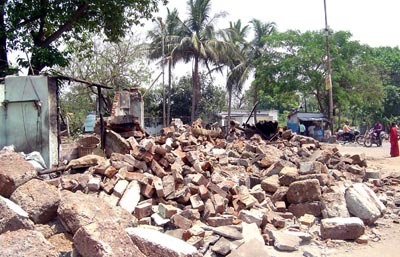 Deliberate massacre of civil health Laws such as the Municipal Solid Waste (Management and Handling) Rules, 2000 (hereinafter called the 2000 Rules) and the Orissa Municipal Corporation Act, 2003 (hereinafter called the 2003 Act) are some of the instances of how Navin has been running a nonchalantly anti-people administration. “any municipal solid waste generated in a city or a town, shall be managed and handled in accordance with its compliance criteria and the procedure laid down in Schedule II”. This Schedule has given elaborate instructions on how to manage and handle the waste. But there are also prohibitions imposed by this Schedule. 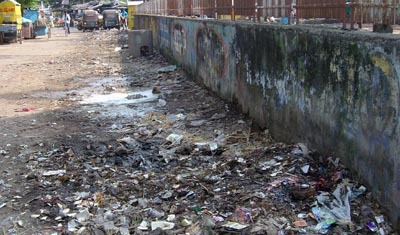 In the Compliance criteria, the basic instruction in the matter of collection of municipal solid waste is stipulated with the words, “littering of municipal solid waste shall be prohibited in cities, towns and in urban areas notified by State Government”. And, under criterion (vii), the stipulation is, “waste shall not be burnt”. How this criterion is raped naked is discernible in the picture already placed above. But the picture below, which is just a sample of what is happening, would show you how solid waste is littered in every busy lane of the city and allowed to lie like that sine die. 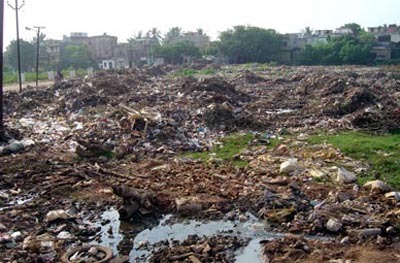 Would you like to know where the Bhubaneswar Municipal Corporation (BMC) dumps whatever solid waste it collects? See the picture below. It is a School premise. In every open space between buildings of sophisticated colonies, solid waste is dumped like this by the BMC. Leave the open space and come to the roadside. See the picture below. See how deliberately civil waste is deposited by the BMC on the side of a major road adjacent to the residence of the State Governor. Who rules over BMC? It is the ruling coalition of Orissa, BJD and BJP. The capital city being the citadel of commission agents nothing else could have been possible specifically as at the time of election to this urban body, Navin Patnaik as Chief Minister had the advantage to use his might in favor of the coalition candidates. 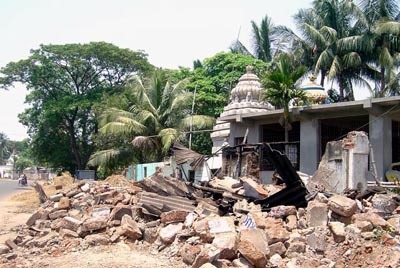 To show how massive is the might of administration, the BMC, supported by the Government in the General Administration (GA) Department and Bhubaneswar Development Authority (BDA), has razed down hundreds of shops including temples alleged to have grown on government lands notwithstanding the facts that these lands have no suitability for any other use than for what they were being used and has smashed thousands of cottages in various slums. 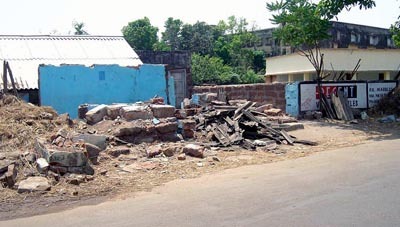 That the slum clearance in certain cases was carried out with a motive to free the land for allocation to mafia under different guise is strongly suspected by the very fact that affected people have recaptured the concerned plots when concerned authorities had been looking at that act of retaliation but were keeping mum lest their hidden design gets fully exposed. The pictures below would show how the shops have been razed down at different parts of the city. These shops constituted the life-spring of the localities. The city being a nasty nest of the rich has no concern for the lower middle class and poor people who live here and/or visit this place from out side daily in search of livelihood. The star hotels and emporiums are too sophisticated for them to step in. For them the roadside shops are the only solutions. If the authorities were sincere in their approach, they should have regularized the shops instead of demolishing them by subjecting them to beautification programs, if any, of the city. But the purpose seems vitiated by unannounced motives. Aggressively avaricious persons have golden days during the present days. Givers and takers of bribe know that money shall play the magic if authorities build up kiosks on the roadsides. Demolition of existing shops on the roadsides in the guise of termination of encroachments is therefore being suspected as a facilitator program. If extrication of government land from encroachment would have been the program of the authorities, the encroachment on the most sensitive plot of land in front of the residence of the Governor could not have been ignored. The following pictures depict just a sample of the cobweb of encroachment that the rich and powerful weave around government plots in the capital city. The land shown in these pictures is the most valuable land of the locality standing in front of the residence of the Governor. An IAS officer then in service had acquired the prime plot in front of the Governor’s house in a dubious way. This land, marked in a government document as land for a petrol pump, was in the area earmarked for government use. 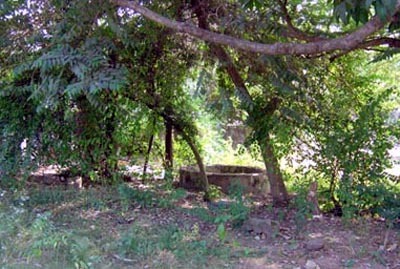 He had used his official influence to convert the land to a private residential plot and he was the only person to build up a private house in the official housing zone. In three sides of this plot, in east, west and north, there were vacant government lands surrounded by roads. He soon encroached upon the eastern side and built up an extended house. A powerful politician has allegedly acquired this land after demise of the retired IAS officer and soon has set his grip over the government land lying vacant in the northern side. The method used to tighten the grip is remarkable. 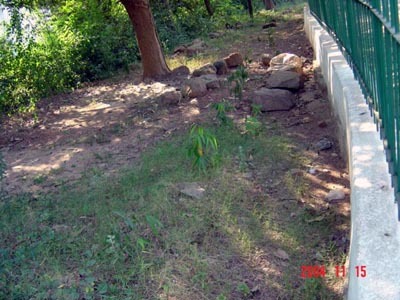 Official staff surrounded the land with iron grills one day and then seedlings were planted to present a picture of official care of the vacant place. As the seedlings grew, the barbed wire fences of the existing house were removed and thus the cobweb of encroachment expanded. The authorities that have cleansed roadside shops and temples in the guise of extricating government lands from encroachment have never bothered to stop encroachment of prime plots by the rich and powerful. But the way the government as well as the BMC have willfully raped the 2003 Act is indicative only of how badly anti-people a government has grabbed Orissa. Thousands of milkmen flocking into the capital city with cows and buffalos having made human life very unsafe by putting up cowsheds on encroached government lands in every nook and corner of the city, specifically as a number of police personnel guarding the Assembly in session succumbed to brain malaria as a result of mosquito bite, the cowsheds being the main breeding centers of mosquitoes, the Orissa Legislative Assembly took a prompt but strong decision and enacted the 2003 Act, enforcing therein a blatant ban on cow/buffalo/goat keeping in and around the municipal area of Bhubaneswar. The Milk Producers Association, Orissa (hereinafter called Gowalas) moved the High Court of Orissa seeking nullification of this Act in their respect, with expressed willingness to shift their sites if regular allocation of land elsewhere in the city is made in their favor for enabling them to continue their trade. The High Court rejected their plea and made it clear that the 2003 Act is just, proper, legitimate and substantive in context of urban management. In Civil Appeal No. 940 of 2006 the Gowals moved the Supreme Court of India to intervene. 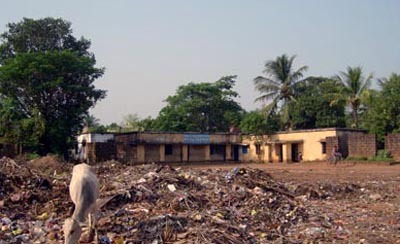 The State Government, in response to this Appeal, had stressed on the thrust of this Act where it “prohibits keeping of animals in the premises so as to be nuisance or danger to any persons besides having other stringent conditions with regard to keeping the cows and buffalos within the city limits of Bhubaneswar” to which the Court had fully agreed and rejected the appeal of the milkmen. “the power under the Act cannot be treated as a power simplicitor, but it is a power coupled with duty. It is the duty of the State to make sure the fulfillment of conditions or direction under the Act. Without strict compliance, right to environment under Article 21 could not be guaranteed and the purpose of the Act will also be defeated”. “Not only filth, stench and unhealthy places have to be eliminated, but the layout helps in achieving family values, youth values, seclusion and clean air to make the locality a better place to live”. 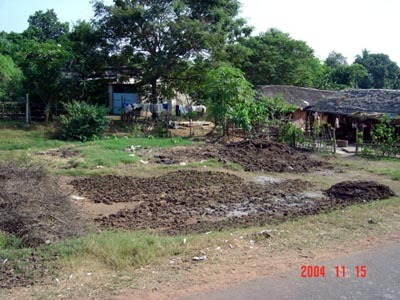 The 2003 Act having bestowed upon the State government a duty to ensure a safe environment free of filth, stench and unhealthy places, the Supreme Court not only appreciated the provisions therein prohibiting cow keeping in the city limits, but also ordered that the Gowalas cannot be allowed to operate even in the periphery of the town. The Gowalas submitted that the State government had earlier proposed to rehabilitate them in places outside the core sector of the city of Bhubaneswar and so the State should be directed to rehabilitate them in the periphery of the city before eviction. The Supreme Court also rejected this plea. “only because they are agreeable to pay for the plot which may be allotted to them, that by itself in our considered view would not clothe them with the legal right to be rehabilitated”. The above decision of the Supreme Court was delivered on 02 February 2006. But till now the Navin Patnaik government has not evicted a single milkman form the Bhubaneswar City. In every unit and locality of Bhubaneswar the milkmen have encroached upon lucrative vacant plots and have been playing havoc with the lives of the local public. Now mark the two pictures placed below. They depict the picture of encroachment on a prime plot as large as half an Acre of land in the heart of Unit 6 by a single milkman. 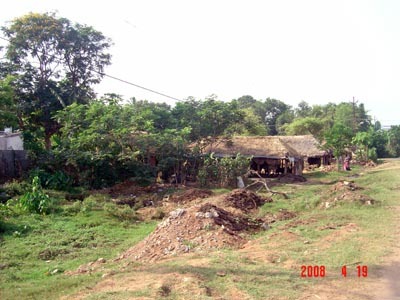 The picture taken on 15 Nov. 2004 shows that the milkman had built up two sheds, one for his family and the other for the cows. The picture taken on 19 April 2008 shows how the same milkman has expanded his empire by adding three more cowsheds to his earlier one. 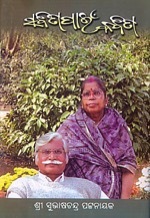 Brilliant scribe Bibhuti Mishra and his equally bright wife Rubi, residing then in the government quarter close to the cowshed, succumbed to acute environmental pollution caused by accumulated cow dung, filth and stench generated by the cowshed. After we discussed the devastation in these pages, the Government has constructed compound walls around the quarters standing at both the sides of the ever-expanding cowshed as you may see from the following picture. Why the Government is protecting the milkmen and allowing them to expand their empires to the total impairment of hygienic environment of Bhubaneswar in blatant contravention of the Act it framed and promulgated in 2003, that too in stark disregard to the Supreme Court decision discussed supra? As we have expressed our inclination to rely on hearsay information, the concerned functionaries of this Government are collecting bribe at the rate of Rs.2000 per cowshed every month and thus, there being 2000 milkmen in Bhubaneswar, there is a 2000 X 2000 = 4,000,000,00 of Rupees illicit income reaped every month by persons who are in positions to halt operation of the Orissa Municipal Corporation Act, 2003. Laxmipur has delivered its verdict: BJD is worse than the Congress. Result of the by-election to Orissa Assembly from this constituency, held because of midterm death of Congress MLA Anantram Majhi, has come out today. Congress has retained the seat through Anant’s son Purnachandra Majhi, who was deliberately planted in anticipation of sympathy support, which is a marked phenomenon in Indian politics. Congress is very jubilant over this victory, specifically as, it has not only effected defeat of the candidate of the ruling BJD in whose favor Chief Minister Navin Patnaik had led an unprecedented expensive campaign, but also, being the last occasion to test voters’ tilt before general elections, it looks like having ingredients to build up self-confidence and solidarity amongst its wrangling leaders and demoralized rank and file. But a study of the scenario would lead us to see that the jubilation in the Congress camp is misconceived and misplaced. People have not voted in Congress favor. As we have already predicted, Congress can never win with Man Mohan Singh as Prime Minister. He has ruined the country by forcing on us USA motives and the resultant degradation of our masses. So, people in Laxmipur have not voted for Congress. The Congress candidate has won; not the Congress. In order to understand this phenomenon, understanding only two aspects of the Congress side of the scenario may help. First, planting of the candidate and second, reaping of the result. 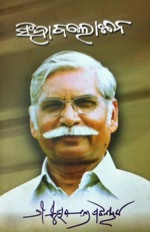 The candidate was the son of the deceased MLA. In planting the son of the deceased MLA, the Congress had only confirmed that as a political party it had forfeited peoples’ confidence and so, it had no chance of winning. With this perception, it had planted Purnachandra, son of the deceased MLA Anantram. There was no dearth of senior leaders of the locality in Congress. So there was no dearth of suitable candidates. But because there was blatant absence of confidence in the party, it could not dare to plant any of them. Congress knew that the wretchedness, to which pro-American economic policy of Prime Minister Singh has pushed our peoples into, would stand as the greatest barrier to generate votes. But it has the experience and expertise in converting obituary sympathy of the peoples into votes as was seen in Rajiv’s vote catching following Indira’s death or in its gaining massive majority following Rajiv’s assassination. So, selection and planting of Purnachandra, son of the deceased MLA, was calculatedly finalized with an eye on obituary sympathy in Laxmipur. Purna won because of the sympathy factor. Had his father not died midterm, he could not have attracted sympathy and could never have won. Had this bereft son of the deceased MLA not been planted as the candidate, no other candidate of Congress could have won. So, Purna’s victory is not Congress victory. It is clear that in total despair due to anti-people policies of Prime Minister Singh, the voters of Laxmipur have conspicuously registered their resentment against Congress by drastically reducing their traditional support for it. Otherwise, despite the sympathy wave, Purna’s victory could not have been so meager. He has won by only 484 votes. His father had won with more than 14 thousand margin in the last general election. In the same election, BSP had bagged around 15 thousand votes despite presence of electoral wave in favor of Navin Patnaik. And in this election it has directed its support to the Congress. So these voters, who despite presence of a wave in favor of Navin had marked their votes against him in the last election, were the persons who should have marked their votes against Navin’s candidate this time too. Had it happened, the Congress candidate should have won with a margin of around 30 thousands. But this has not happened. But how then the Congress candidate could win? He could win, because, otherwise it could have been our peoples’ expression of approval of Navin’s misrule. To our people Navin Patnaik is worse than Man Mohan Singh. The way Navin electioneered in Laxmipur was viewed by the local public as a blot on democracy. He being the Chief Minister unleashed a hate campaign against the Union Government in stark disregard to national integration and tried to overwhelm the rural electors by pressing into campaign a team of eleven of his ministers and as many as 47 MLAs of the ruling alliance. He tried to make people awestruck by blitzkrieg of campaigning in copters and by making them see how the officers of the area who rule over the people were at his beck and call. He electioneered in such a fashion that democracy looked as if subdued by autocracy in that rural constituency where 90 percent inhabitants are illiterate. He shed meretricious tears over the plight of the people who have been perishing under continuous slow starvation sans land and livelihood when he is single-mindedly busy in handing over Orissa’s land and mines and natural assets to non-Oriya business operators and swindlers. His dazzling campaign that poured down at least 10 crores of Rupees into electioneering in this constituency, where cholera due to loss of immunity under continuous slow starvation extinguished hundreds of life last year, made people conscious of the quantum of corruption his government must have been involved with in order to arm BJD with the huge election funds. People came to the conclusion that Navin Patnaik is worse than Man Mohan Singh. They decided to teach him a lesion. They stamped their kicks of disapproval on the face of Navin’s campaign by refusing to elect his candidate and conversely therefore, they decided to elect the Congress candidate with as small a margin as possible. As they also disapprove the anti-people policies of Man Mohan Singh, they refused to grant Congress a grand victory. The Congress candidate got elected on the border of defeat.